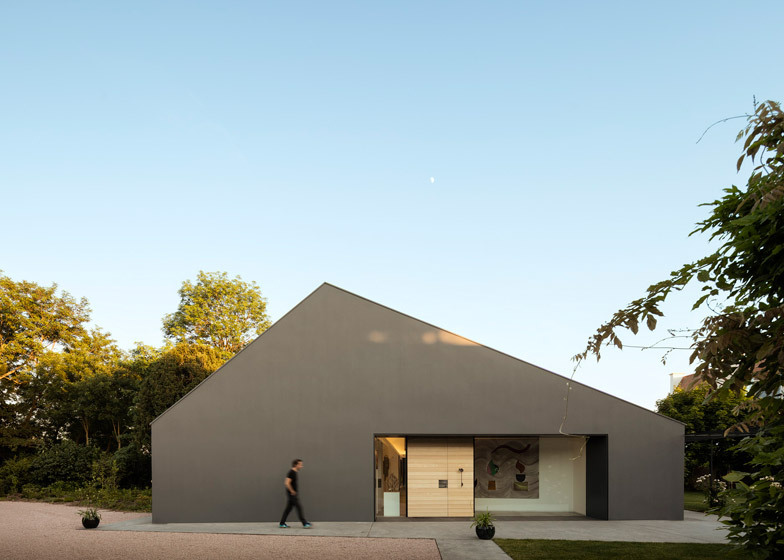 French studio Marchi Architectes has completed an asymmetric gabled house featuring a room that functions as a courtyard and a generous corridor that doubles as an art gallery (+ slideshow). 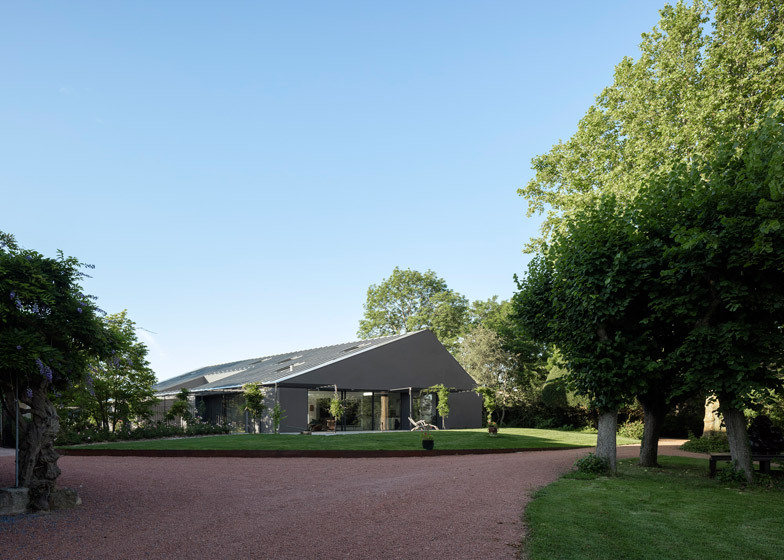 Located in Auvergne, a mountainous region in central France, Chestnuts House is a home for a pair of art collectors. 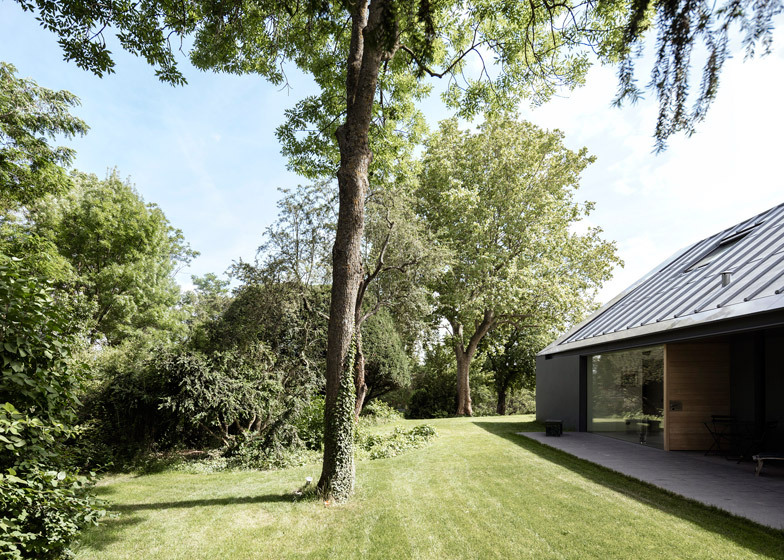 Their brief was for a single-storey residence that fits comfortably with its setting, and also includes a private courtyard. 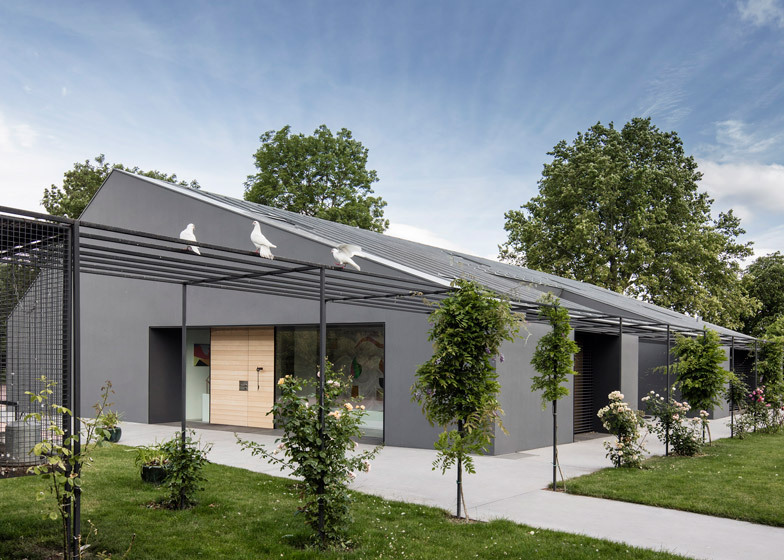 Marchi Architects responded by designing a simple low-rise structure where rooms wrap around a recessed terrace, which is exposed to the elements thanks to a large rectangular opening in the roof. 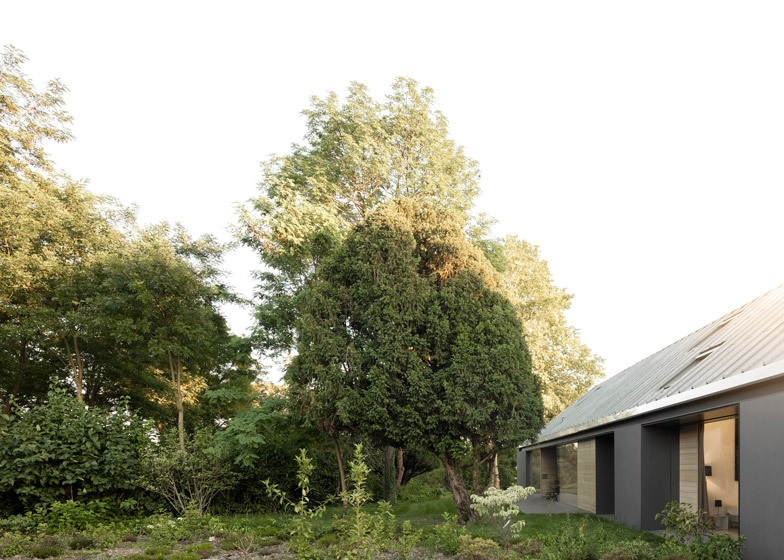 The building's asymmetric profile, as well as its grey-rendered facade, help it match the scale and appearance of neighbouring houses – including a 19th-century house and various newer structures. 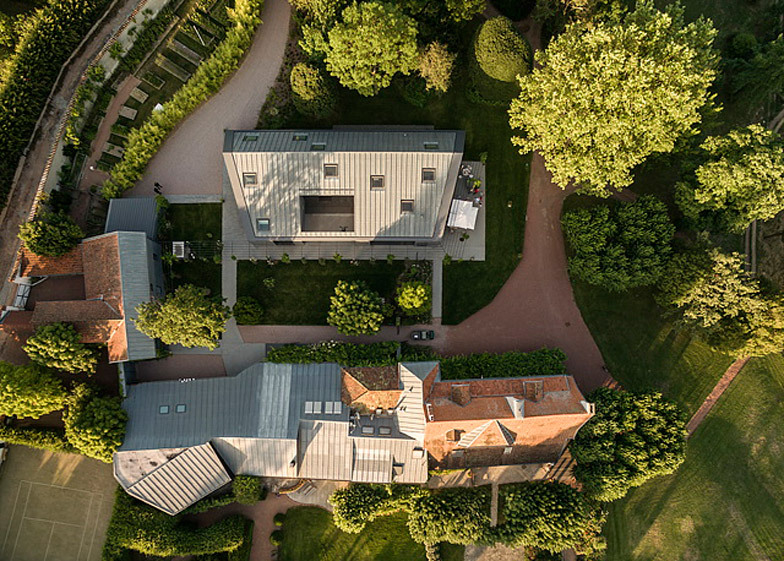 "The new house is set in order to maintain the volumetric balance between the existing buildings on the west side of the courtyard," explained architects Adélaïde and Nicola Marchi, whose previous project include a sunken house extension in Normandy. 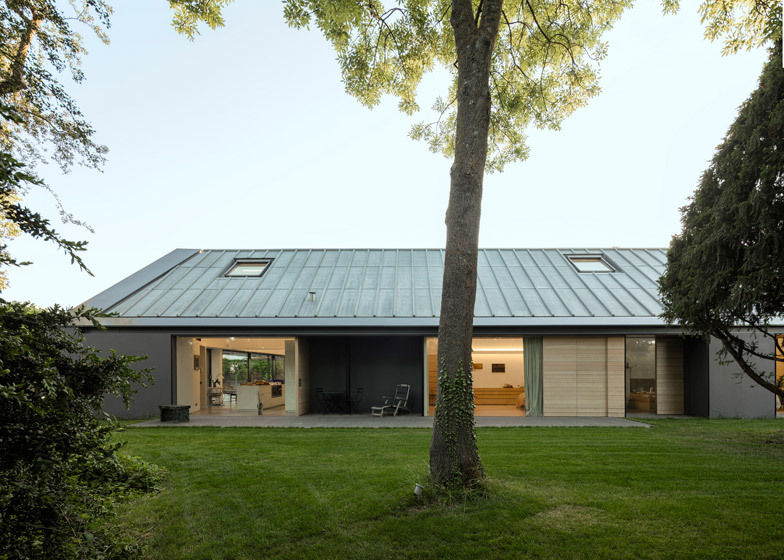 "The pitched metallic roof is asymmetrically designed in order to dialogue with the courtyard on the west and to recall a demolished building on the east side." The main entrance is located on the northern side of the house. It leads through to the central corridor where residents display a section of framed drawings, large painted canvasses and a selection of sculptures. "The clients change the artworks every week," revealed the architects. At the end, the corridor opens out to become a large living and dining space with a kitchen over to one side. 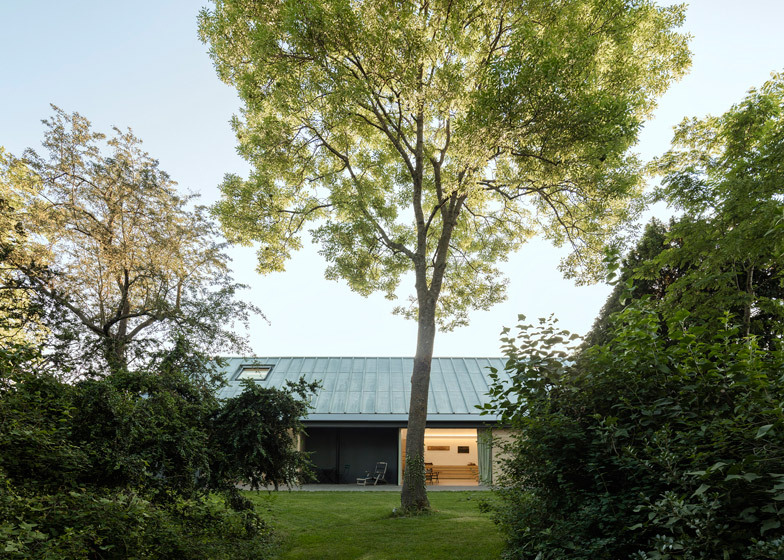 Glazed walls allow this space to open out to the garden, and also create a view right through the house. The wall between the courtyard and corridor is also glazed, allowing plenty of light to filter through the building. There are also numerous skylights puncturing the roof. A steel trellis wraps the building's south- and west-facing elevations, framing both the courtyard and the living room. 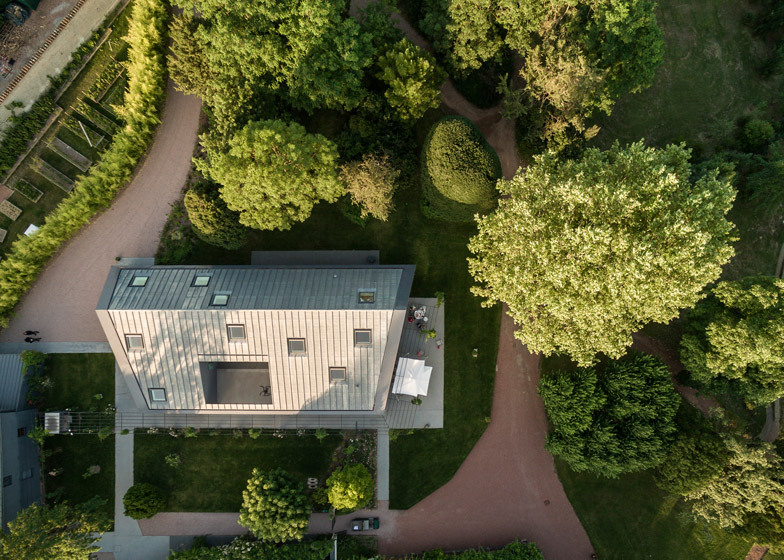 "The lightweight steel structure permits vegetation to climb, so that in the future plants will cover the house," said the architects. Other rooms inside the house include three bedrooms, each with their own en-suite bathrooms, as well as a home cinema and a small study. 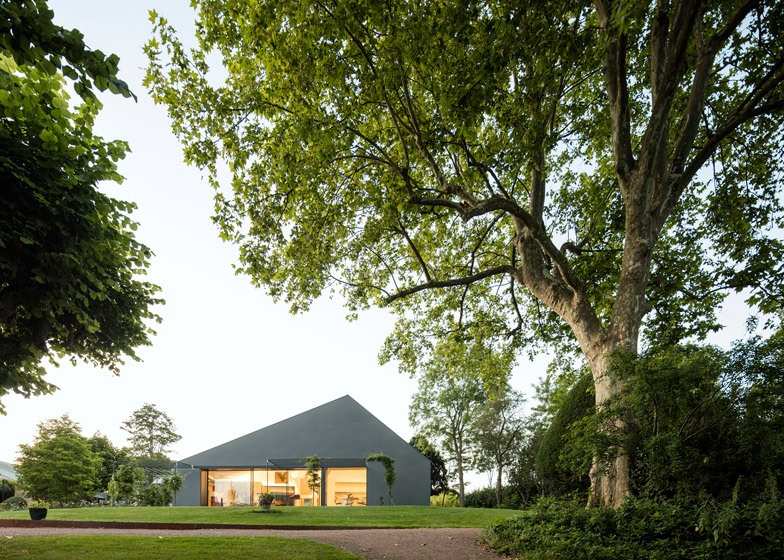 Chestnuts House is the latest is a strong of recently completed homes with asymmetric profiles. 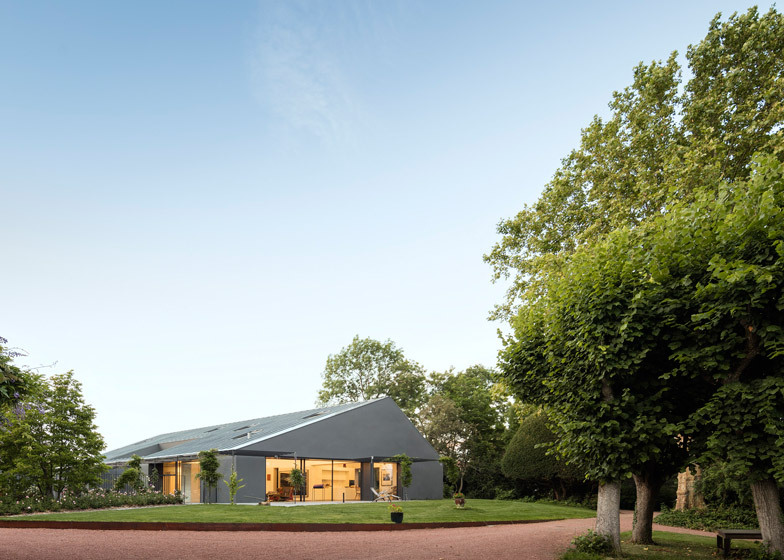 Others include a brick property in the Dutch village of Riel and a suburban tile-clad house in Belgium.